Tennessee figures to try and add a handful of linebackers in their 2020 class, and they recently just extended an offer to one of the top linebackers in this cycle. Jordan Botelho is a four-star linebacker who plays for St. Louis High School over in Honolulu, Hawaii. He recently added an offer from the Vols to go along with already impressive offer list. The 247Sports Composite rankings lists Botelho as the No. 148 overall player and No. 5 inside linebacker in the 2020 class. The regular 247Sports rankings list him as a top-100 overall player, though. He comes in at No. 97 in those rankings and is the No. 3 inside linebacker. 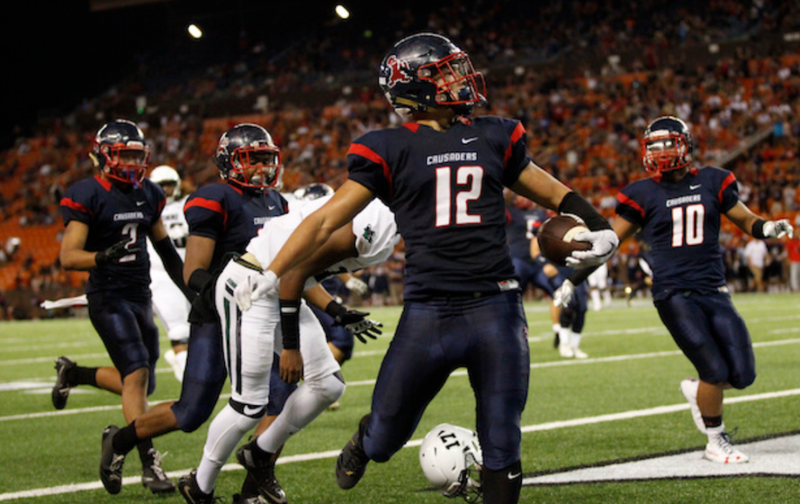 Both rankings have him as the top overall player in the state of Hawaii. Right now, Botelho holds offers from Washington, Oregon, USC, Georgia, Oklahoma, Notre Dame, and LSU among others. You can get all of our in-depth analysis about Tennessee recruiting, football, basketball, and more by becoming a member of RTI Premium today! Though the 6-foot-3, 220-pound linebacker is listed as an inside linebacker on recruiting services, he’s played primarily at outside linebacker for St. Louis. And he was exceptional as a junior last season. Botelho has great speed off the edge, and he’s hard for offensive tackles to handle. Even when they do get a hand or two on him, Botelho has the skill set to get by them and into the backfield. He’s deceptively tough and can shed blocks effectively. I’m also impressed by his footwork and his vision. He’s not just a pure pass rusher either; Botelho can stop the run, too. He just has a knack for making plays, and his speed allows him to make more of them than other linebackers. As a junior, Botelho totaled 15 sacks, 13 tackles for loss, four forced fumbles, and scored four total touchdowns. Last season, he was awarded the Cover2 Manti Teo Award as the Defensive Player of the Year in Hawaii. The Vols will likely look to add three or maybe even four linebackers in their 2020 class. Tennessee added Quavaris Crouch and Henry To’oto’o at linebacker last cycle, but they’re probably losing three if not more linebackers off the current roster by the time the 2019 season is over. Linebacker figures to be a big emphasis for the Vols in this cycle, and Botelho will be a name to keep an eye on.